With ever-increasing emphasis being placed on design and aesthetics, it’s no wonder that nowadays, we’re inundated with beautiful products to “enrich” our buying experiences. I will admit that I’m a total sucker for a beautifully packaged object… it all adds to the delight of cradling that new purchase in your hands and feeding…well… kinda ‘good’ about it no? How horribly shallow. I will have to feed my soul with some wholesome, profound and worthy thoughts about BINTM to make amends… <…> …Ok, I’m over it. But it’s always good to remember Aesop’s words reminding us that “Outside show is a poor substitute for inner worth.” It’s all too easy to get swept along on a tide of “ooh pretty” and forget about the product inside. Perhaps more than any other, the beauty industry should be driven by physical results, why else would there exist so many beauty bloggers slathering products on their faces like no tomorrow, eager to share their findings? So is it kinda ludicrous that there is such importance placed on how products look externally? I want these limited edition Steam Cream Xmas tins from Selfridges… I don’t even really like the product (it’s nice enough but doesn’t rock my boat) and yet, gimme. 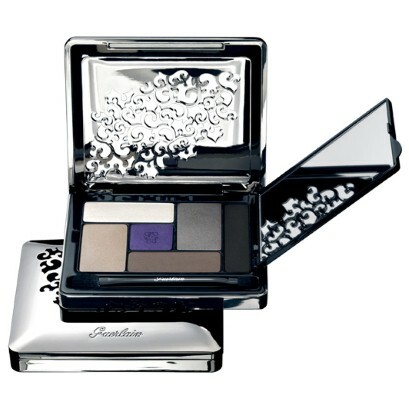 And how about those Guerlain palettes… you know the ones, the horribly expensive but atthesametime ridiculously beautiful chrome cut-out ones. They’ve generally received luke-warm reviews, but I still want to stroke one and make it mine. And of course, Paul & Joe… well they know how to make a product look nice don’t they? Whenthey tweeted an image of the lipstick below a couple of weeks ago, I knew I wanted one. Of course it helps that the shade shown is hawt but still, I reckon I would have bought one even if the shade was a bit boring. Art Deco styled lipsticks? GOD yes. Now, don’t get me wrong… I am admitting to shallowness and I’m admitting to having my head turned more readily by something that appeals to my inner magpie. But I’m not saying that style overrides content. It just… helps. Are you a sucker for beautifully presented beauty products? What is your most ‘beautiful’ purchase? 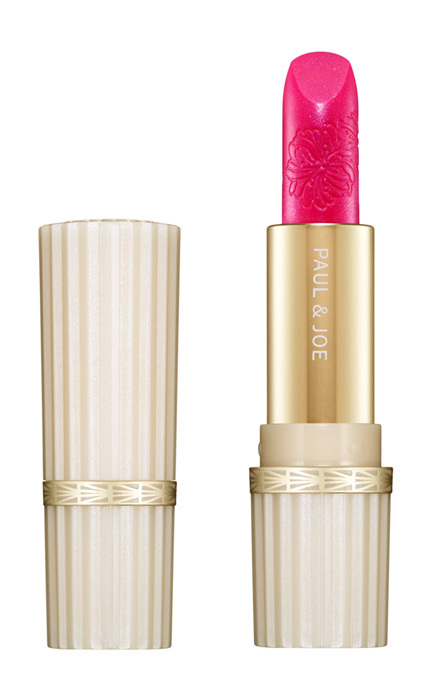 LOVE the Paul & Joe lipstick, it looks beautiful!! Oh God, I’ll buy anything if it looks pretty. I think aesthetics have to come into play when all the products are of a similar quality. I won’t buy something unuseable just because it looks good…but I do have a lot of Too Faced stuff because I adore the palettes and packaging. The products themselves are a bit ‘meh’ at times. With lipstick I love a really glam case (Guerlain or YSL or something) so when you whip it out you feel a bit more sophisticated than when you used to top-up your Coffee Shimmer in the girls loos at breaktime. I remember all I wanted when I was a teenager was one of the Hard Candy nail polishes with the jelly ring on that were in all the magazines (but impossible to find in, um, Kidderminster). I got one when I was 18 on work experience at a mag, and the polish was pure crap. I felt so let down! But it still took pride of place on my dresser for months because it looked nice! Guilty as charged but at least I’m not alone right?? Always sucked in by packaging, just like I’m instantly drawn to books with pretty or interesting covers. I often find that a lot of the beautiful looking products aren’t all that great when used. I love great packaging, but the formula is FIRST! I do like pretty packaging, but it won’t necessarily make me purchase. I’m mostly drawn to minimalist and sleek, and I don’t mind gimmicky as long as it’s functional. For example, some people say that Guerlain Rouge Automatique lipstick and the Ellis Faas pens are gimmicky. I say gimmee. I don’t, however, like the lipstick tubes from Julie Hewett’s Noir collection. Though retro, they are bulky and asymmetrical, such that they take up too much room. I love P&J’s retro shell-pink packaging, but I am not a big fan of their cardboard lipstick tubes. And I hate Benefit’s cardboard, which so many people love. What absolutely does affect my purchase is crappy packaging, even if what’s inside costs a king’s ransom. If I am paying luxury prices, I expect luxury packaging, dammit. One high end brand, which I will not shame by naming, recently changed its packaging from gorgeous to total crap. I stopped buying that brand, even though I like what’s inside. Chanel, YSL & Tom Ford lipsticks are my undoing. The sleekness is just too much, I m.u.s.t own them all! I’m ridiculously swayed by packaging – if I’m spending money I want something to look good as well as be good, however I am sensible and try not to get too into buying things solely based on how they look.
)) and I don’t want to end up app Attila the Mum over a Guerlain palette! So for now, I buy things I won’t be heartbroken over losing. The few things I already have are in the loft for safekeeping! I used to buy a lot of products just because the packaging looks pretty but I often ended up being disappointed by them. So now I just wait for reviews to see if the product is actually good and worth buying. It still helps if the packaging is pretty but that’s not as important to me anymore. That Paul and Joe lipstick is GORGEOUS. I would totally buy it. I love the color too! But the swanky packaging definitely erased my hesitation when I bought Chanel Peridot. xD Yessssssssssssss I think the packaging sparks an interest in me; but for instance. Reading what you’ve said about the Steam Creams and the Guerlain palettes turned me off of them entirely. Maybe it’s because i’m a newb at this, or maybe because my first home-built computer looked like junk but ran like a dream but I’m all about the internals. I can definitely be a sucker for packaging; whether it’s just pretty or super kitschy. I bought one of the Hello Kitty eyeshadow palettes from Sephora even thought the product was semi-crappy and a Tarina Tarantino eyeshadow palette (where the quality of the product was better) because the palette had roses and skulls and rhinestones and fake pearls. They look super cute on the shelf in my bedroom though! I love seeing the pretty packaging but I won’t spend my money on something just because the packaging looks good. I’m more about the product. I’m a sucker for gorgeous packaging.. but I do really see if the quality of the product is good also. I agree with the ones who say that pretty packaging is a bonus. It’s probably last on my list of priorities when it comes to makeup. But packaging is important to me, in that I want it functional. I hate gimmicky packaging and had a little bit of a go-round with G at Nouveau Cheap over the new Salma Hayek’s Nuance eyeshadow “pods”. To me they are bulky and ridiculous, you certainly can’t store them neatly with your other palettes. But to her and so many others it’s something new and interesting that piqued their interest. I also know many women are put off by Milani’s retro cheap packaging, some have even said they won’t even try the brand because the packaging is so ugly. I don’t particularly care for it, but I love Milani’s products, so I buy anyway. actually fancy packaging puts me off, novelties that have xmas trees on, I dont want that in july!